June/July 2017 Edition: Corporate Solar – Off-Site Alternatives: Is on-site solar not a viable option for your business? Off-Site solar may be your answer. AEP Energy Customer Insights reviews the advantages of off-site options, including structuring considerations and the importance of working with a provider that has expertise in both the solar market and the energy supply market. In our May edition, we provided the steps to take when considering on-site solar for commercial and industrial organizations. Since on-site solar may not be a viable option for every business, there are other options, such as an off-site solar plant. We’ll review the advantages of this type of arrangement, including structuring considerations and the importance of working with a provider that has expertise in both the solar market and the energy supply market. With off-site solar, the electricity generation can be delivered to your site from a remote solar facility. This type of arrangement is a great alternative for customers who have multiple locations that aren’t suitable for solar due to limited roof space or land available on premise and who have access to competitive generation supply. In addition, many organizations choose off-site solar due to corporate sustainability programs and goals, and/or who place value on the positive exposure it can have with employees and customers. Unlike an on-site behind-the-meter (BTM) solar plant, an off-site plant is directly connected to the energy grid. When the energy is produced it is sold at the location it is generated and at the current market rate. The off-site plant can be incorporated into your organization’s energy purchasing strategy and structured according to the applicable market, desired accounting treatment, and risk management approach. The installation size can be custom made for your business based on how much energy you need. You are not restricted with siting limitations at your facility. A ground-mounted system is typically installed for off- site projects. Where roof-top space is a constraint preventing on-site projects, ground-mounted systems can be constructed on inexpensive land anywhere within the Independent System Operator (ISO) territory that is shared by the retail loads, such as PJM. Multiple locations benefit by off-setting their usage. Optimized for size, production, renewable energy credits (RECs), sales and property tax, land costs, and other location specific value drivers, which may drive down the average cost of the energy supply portion of your bill. The cost for off-site solar is the loss of BTM savings to energy and demand-based charges. However, where BTM siting is prohibitive, benefits of off-site solar could not otherwise be attained. The off-site facility essentially becomes a long-term renewable power contract. The regulatory regime for the retail load and generation locations is important to understand in determining the required deal structure. For facilities in a regulated market area, the only option is a “virtual power purchase agreement (PPA)”, which is when the solar generation at a particular solar facility is sold at market prices, while the consuming facilities buy at a locational index. The market sale of generation, coupled with the market purchase, acts like a financial exchange creating a virtual PPA. In regulated regions that offer community solar programs, this approach is simplified, subject to the particulars of the program. Consult your energy provider to address these specific issues as they arise. Financial delivery: Similar to a virtual PPA, this type of arrangement should be reviewed for the appropriate accounting treatment as a trade and/or derivative. Physical delivery: With this arrangement, the generated energy is scheduled directly in real time to the retail energy supply provider of record for the loads. The power is not sold for resale, but delivered directly for self-consumption. This has positive implications for regulatory approvals needed from the Federal Energy Regulatory Commission (FERC). Projects that sell directly to the energy grid require the seller to have FERC licensing and membership with the relevant transmission operator. For many customers, these costs and complexities are prohibitive. Partnering with a retail energy service provider capable of handling these complexities opens the door to reaping the benefits of physical delivery structure. For most customers who have considered on-site or BTM solar, the value drivers are the avoided costs associated with BTM generation. Generating energy on-site means you avoid costs such as capacity charges, transmission peak charges, any volumetric charges billed as $/kWh, and to a lesser extent, distribution demand charges. With off-site solar, these benefits are not available since all power is being imported at the utility meter. The imported solar power will be assigned the same charges as the rest of your energy supply. However, savings may be generated through a reduction of your energy supply costs, merchant capacity revenues, and the generation of Solar Renewable Energy Credits. (SRECs). In PJM, some states, such as New Jersey, today have SREC markets exceeding $100/MWh, though most are between $5 and $10 per MWh. Even if SRECs are generated and sold in one state, SRECs from the market where the load is sited can be acquired for less and can be used to ensure the energy supply is providing emissions reductions. This underscores the importance of siting the virtual solar project in a location where all cost and revenue considerations can be managed. As mentioned earlier, an off-site solar plant will be directly connected to the energy grid. When the energy is produced it is sold at the location it is generated and at the current market rate. The energy is then transported on the energy grid and passes-through multiple locational nodes, the path the energy takes to each load will dictate its final value. The value between the initial selling price and the price at the load can be higher or lower. This difference is known as location basis risk and is variable depending on the market at the generating point and the delivery point. Understanding who is accepting this basis risk and how it will be managed is critical to the success of these arrangements. The basis risk may be hedged in the wholesale market with financial transmission rights, managed by the retail energy supplier, or naturally offset by the location of the plant and loads. Please note that in the case of businesses with numerous load locations in different parts of a transmission system, there is already substantial basis risk present. Creative siting of the solar in a congested area, or neutral to the existing loads, can help reduce this existing basis exposure. Capacity values from solar generation will be relatively low, but can be relevant. Depending upon the regional market, capacity may be sold in wholesale auctions or bilaterally. The risk with solar capacity is the variability of production and the risk that selling the capacity may add delivery risks or failure penalties. Due to the complexity of executing this type of structure it is recommended that you work with a solar developer who understands both the solar market and the energy supply market. Many developers are focused on site permitting and construction, but fail to understand how the energy supply arrangements will work. By combining the knowledge of both these markets, the provider should be able to provide you with a long-term PPA for the solar, similar to those found with BTM solar, and an energy supply contract which takes into account typical market considerations and the location basis risks. Linking solar energy supply with your remaining energy supply, will allow the retail energy supply provider to value the benefits of the solar production on your load shape, implement a congestion strategy, avoid FERC licensing requirements for the customer, assist in the accounting structuring, and to assist with the renewable energy credit management. This type of bundled solution will allow the customer to go solar and maximize the benefits from both a carbon offset and an energy savings perspective. AEP Energy, along with AEP OnSite Partners, can provide a bundled solution where AEP OnSite Partners builds, owns, operates, and maintains the solar asset, and AEP Energy optimizes the overall energy supply strategy for the customer taking into account the benefits provided by the solar. 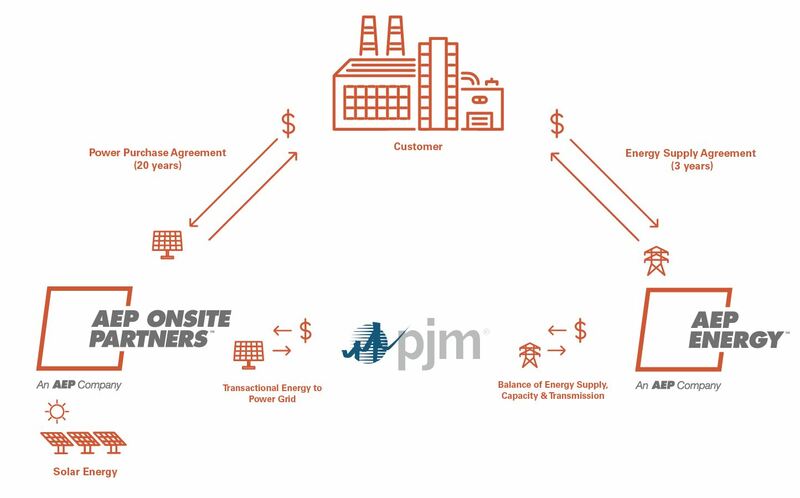 Below, we’ve provided a diagram depicting how the partnership between the business customer, retail energy supply provider, AEP Energy, and the solar developer, AEP OnSite Partners could be structured. This report made by AEP Energy contains projections and future expectations that are based on reasonable assumptions, but any such statements may be influenced by innumerable factors that could cause actual outcomes and results to be materially different from those anticipated, including (without limitation) changes in utility regulation and the allocation of costs within regional transmission organizations, including ERCOT, PJM, MISO and SPP. AEP Energy is an affiliate of AEP Ohio. AEP Energy is not soliciting on behalf of and is not an agent of AEP Ohio. AEP Ohio customers do not need to purchase any competitive retail electric service from AEP Energy to receive or to continue to receive non-competitive retail electric services from AEP Ohio. Copyright © AEP Energy, Inc. All Rights Reserved.